The dream of building a large-scale structures using 3D printing technologies drive many initiations to experience different techniques to create 3d printing concrete that can be used in creating architecture structures either as a complete unit or as separated pieced that can be assembled in construction location. 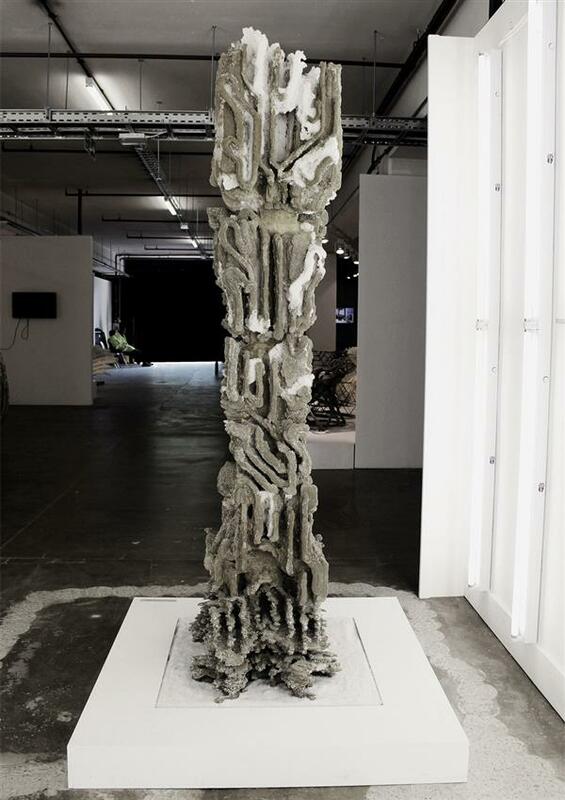 One of the recent initiations presented by postgraduate student in the Bartlett School of Architecture, who has developed a a new 3D printed concrete that is created using two 3D printing technologies; the extrusion and powder bed printing. The new technology is called Fossilized as the created concrete structure looks similar to natural fossils. They started a start-up project based on the new technology named Amalgamma. The challenges that faced previous initiatives included the cost and printing time required to complete 3D printed model. One of the advantages of the new technology is the low cost and and produced reliable results, which may qualify it for industrial implementation. The Fossilized 3D printing technology presented by master degree students Alvaro Lopez Rodriguez, Francesca Camilleri, Nadia Doukhi, and Roman Strukov, using an ABB robotic arm that is programmed to follow a fabrication tool path. 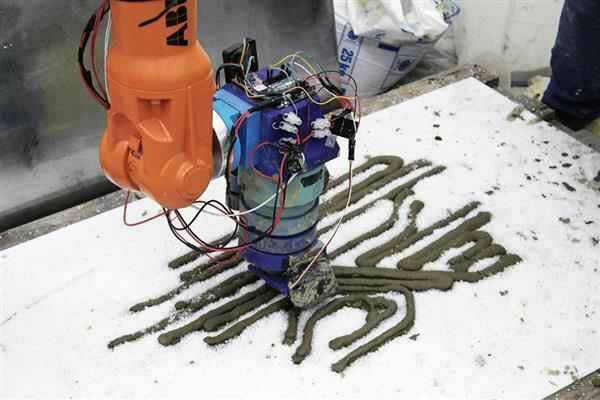 The concrete is pumped to the robot arm head with extraction width of 1 cm and build the 3D construction based on layers. Amalgamma 3D printing robot in action. The powdered 3D bed technology is used to inject a binding agent to the print bed, which harden the powered 3D printing material to solid form that can be used to build a complex of concrete layers. In addition to the two compositions, another head pumpes layers of granular or supported material. A binder is used to detect the weaknesses and the hardens parts and produce a mute-materials printed piece. A column created by Amalgamma technology. The technology has been tested in 3D printed columns and tables that were presented in AD Bartlett show in October 2015. This prototype is the start for more investigation about the viability of the new technique that will be developed further. the above video shows how the new Fossilized technology works and used to build architecture structures. This post is created by the 3D Printing Pin team. We would like to hear your comments and ideas. Feel free to share it with us in the comments form below. © copyright 2013 3dprintingpin.com | 2checkout.com is an authorized reseller of goods and services for 3D Printing Pin.